We are offering an extensive series of Graphite Bush. These products are extremely employed in the market for diverse purposes. 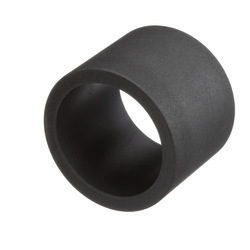 We manufactures dry Self lubricate bushings, which requires no grease for continuous operation. The diamond shaped indented pockets on the alloy surface are filled with graphite, which ensures lower co-efficient of friction and survive dry run application eliminating seizure. We are the reputed firm of industry, specializing in offering customers a best quality range of Graphite Filled Bush. Designed and manufactured by trained personnel, our products have become the preferred choice of large clientele. We have adopted strict quality parameters, to ensure that our products are free from any defect. - Tie-bar bush bearings for injection molding machines. - Bearings for use at a high temperature, including iron and manufacturing machineries. - Bushes for Automobile production line. - Arm link Bearings for power shovels. We are offering Graphited PTFE Bush to our client. Carbon and graphite bushes used as bearings where normal oil and grease lubricants do not work with corrosive liquids and gases and where contamination by conventional lubricants is undesirable. 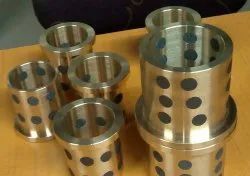 Carbon rods and bushes are also used for machining into parts of required sizes.